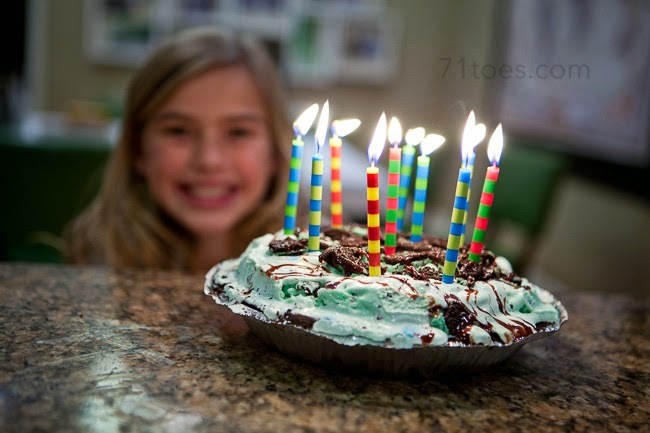 Claire requested grasshopper pie for her birthday cake. And she didn't mean the "home-made" kind of home-made one you can find recipes for flooding the internet if you google "grasshopper pie." She meant the same one I made for Thanksgiving a couple years back because I don't like "real" pies and I was assigned to bring a few so I branched out. Apparently it was that good to her. So I whipped it right up for her lickety-split. And I figured I should share because who wouldn't want this chocolatey, minty goodness for a treat now and then? 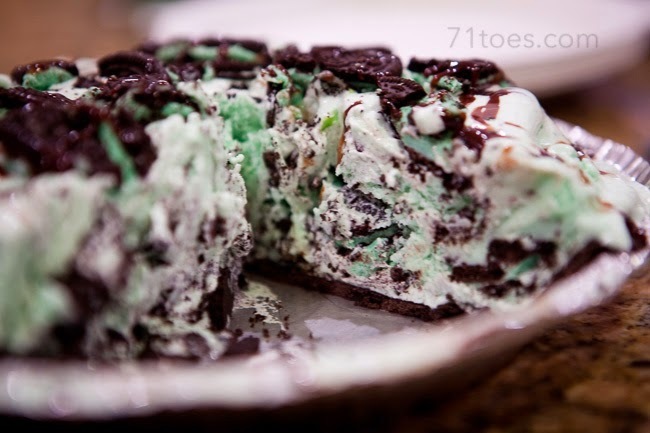 --1.75 or 2 pint container of mint chocolate chip ice cream. We're off to a healthy start, right? Let the ice cream sit on the counter for a while 'til the carton is all softened up when you squeeze it. Pour that into the Oreo crust. Chop up half of the mint Oreos that are left over after your kids get home from school and eat a bunch of them without thinking clearly to themselves "wait, mom doesn't generally buy these just for us to eat on a random Tuesday afternoon, maybe they're not really supposed to be an after-school snack" and then they eat a couple more. Then mix the last half of the ice cream with a couple more spoonfuls of Cool Whip and add that to the pie. Chop up the rest of the Oreos and top off your creation with them and some drizzled hot fudge. Place in the freezer and let set for a few hours. But it still tastes pretty darn good. And I don't even really like ice cream. Yummy! I love your blog (both words and pictures!) I look for an update everyday. I am not of the LDS faith, but I am a mother and a Christian and I respect your faith very much. yeah, you forgot to mention that today is your birthday!!! shawni - i know that a million people who read this are glad you were born, but i am gladder, because i get to be your sister! love you so so much!! Yummo! I have done the same one with orange sherbet and Halloween Oreos in October. Delicious. Yum! Have to wait to have some people to gobble this down. Hope your day yesterday was awesome and that you got our messages! How does one use "shawni" as the promotion code for joy school? I have tried but can't find a place to enter it for a discount. Is there a spot I am missing? Choosing the right footwear according to the activity being done is essential in doing it properly.